The major difference between Rossini and his bel canto contemporaries Donizetti and Bellini lies in the words, not the music. If it was Verdi who brought opera to theatrical heights via his choices of skilled librettists, the path to his success was started by Donizetti and Bellini who collaborated with dramatically adept dialogue-smiths to create music-dramas as viable backdrops for beautiful bel canto singing. So much for Act I. 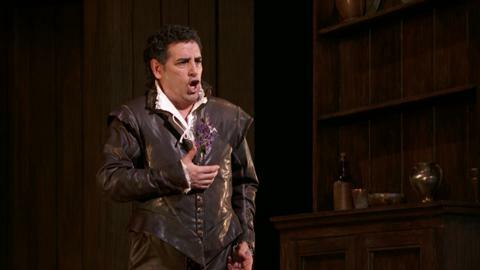 Things picked up a bit in Act II, with some dramatic dialogue between the characters and it was easier to enjoy all the singers’ remarkable coloratura abilities. 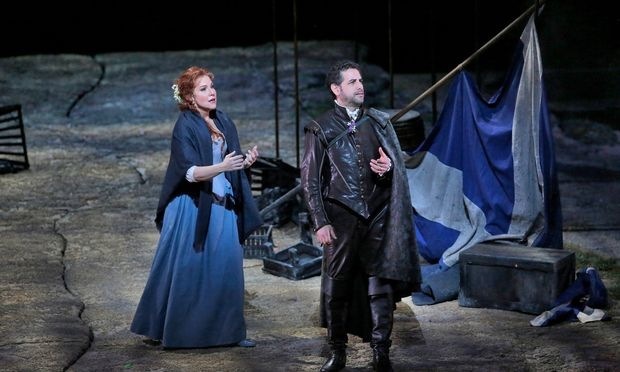 The plot involves the lady of the title role, Elena (mezzo, Joyce DiDonato) and the four men in her life: her father, Duglas D’Angus (baritone, Oren Gradus) who had left the good graces of the Scottish King’s father, which seems to have caused a little war between the present King, Giacomo V (tenor, Juan Diego Flores) and a Highland Clan led by Rodrigo (tenor, John Osborn) who, thanks to the demands of her unsympathetic father, is also betrothed to Elena against her wishes and her requited love for Malcolm (mezzo, Daniela Barcellona). Who Malcolm is, and where he has been before he shows up in the opera and what he does and why is never explained. Beautifully costumed by Kevin Knight and brilliantly wigged, face-painted and “flavored” by the Met make-up department, four outstanding Rossini-bel canto singers (DiDonato, Flores, Barcellona and Osborn) did as best they could with the less than thrilling Rossini music that does not compare to his music we heard three of them sing before recently – DiDonato in “Cenerentola”, Flores in “Le comte Ory”, and Osborn in “Armida.” Gradus, a less than world-class performer, was joined by comprimario singers Eduardo Valdes, Olga Makarina and Gregory Schmidt in smaller roles. 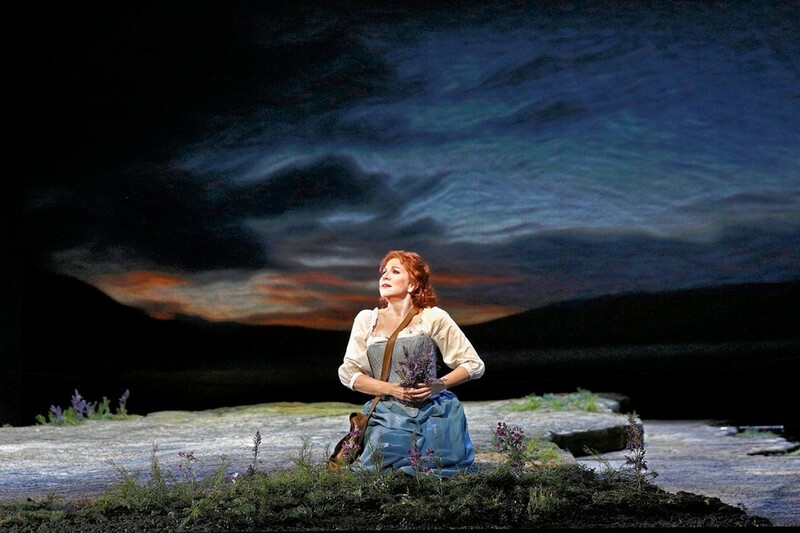 “La Donna del Lago” is based on the French translation of Sir Walter Scott’s narrative poem “The Lady of the Lake”. Scott’s basic story has been noted as coming from "the hint of an incident stemming from the King James V’s (Giacomo in Italian) frequent custom of walking through the kingdom in disguise. The libretto is by Andrea Leone Tottola, whose verses have been described as "limpid" by one critic,” according to Wikipedia. Adding to the less than satisfying performance was the fact that the Met chorus was not up to its usual brilliance, nor was the orchestra, conducted by Michele Mariotti. Perhaps the mediocre music just was not able to stir enough oomph in the performers and musicians to offer up a grand, grand-opera. The next in the series promises to be much more exciting, as “Cavalleria Rusticana” and “I Paglaicci” are one-act operas known for both great music and great drama. They will be performed on April 25 at – note time – 12:30pm. Come at 11:45. Grab a snack (by donation) and enjoy the pre-opera talk in the lobby of the beautiful Seelig Auditorium. For information: 845-434-5750, ext. 4377.